Amidst all the talk and politics in Washington about what constitutes "clean energy", major U.S. utilities are quietly increasing the nation’s wind generating capacity. Xcel Energy recently added to the nation’s wind generating numbers with its 201 MW Nobles wind farm in Minnesota. At 201 megawatts, Nobles Wind is Minnesota’s second largest wind power project. The project involved M.A. 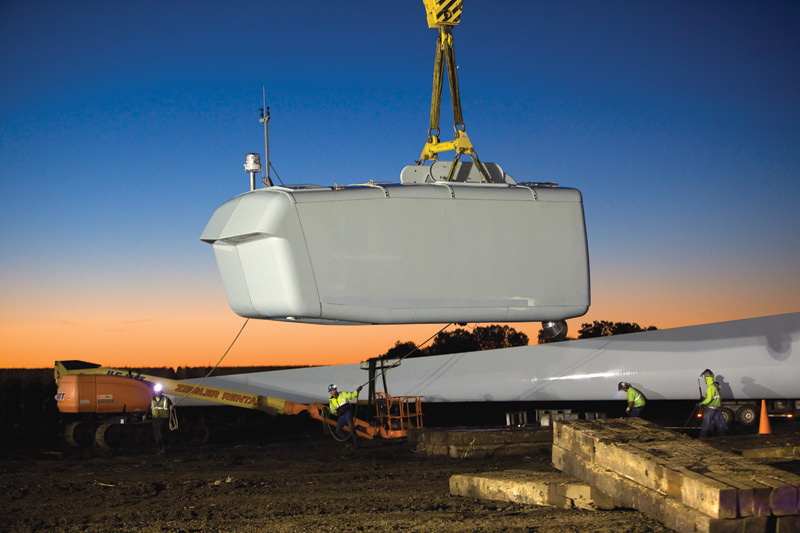 Mortenson Construction erecting 134 GE 1.5-megawatt wind turbines on 42 square miles of farmland in Nobles County, about three hours southwest of Minneapolis. In his State of the Union address earlier this year, U.S. President Barack Obama clearly put the challenge out there for the alternative energy industry: he outlined the goal of achieving 80 percent of U.S. electricity from "clean energy sources" by the year 2035. The American Wind Energy Association’s Denise Bode was quick to respond, noting the industry stands ready to move ahead—now—in a significant way. "Wind energy is ready to go now; we don’t need to wait nearly three decades," she said. Bode noted that by 2030, wind can be up to 20 percent of the electric supply all by itself, according to a study done by the Bush administration. Amidst all the talk and politics, though, America’s utilities are carrying on with business, and are continuing to add to the nation’s wind generating capacity. The U.S. wind industry built 5,115 megawatts of wind power in 2010. One of the larger projects, completed toward the end of the year, was the $500 million Nobles wind farm in Minnesota, developed by enXco and built by M.A. Mortenson Construction, for Xcel Energy. At 201 megawatts, it is Minnesota’s second largest wind power project. The largest is the 205.5 Fenton wind power Project that enXco owns, which is in the same area of southwest Minnesota as the Nobles project. Fenton supplies power to Xcel Energy. The Nobles wind project moves Xcel Energy further along toward its target of generating 30 percent of its retail electricity from renewable energy sources by 2020. Most of the electricity generated by the project will be used by customers in the Twin Cities metro area.The project involved Mortenson erecting 134 GE 1.5-megawatt wind turbines on 42 square miles of farmland in Nobles County, about three hours southwest of Minneapolis. Mortenson also installed 36 miles of access roads, 86 miles of collection system, 134 foundations, a switchyard to feed an existing substation, and an Operations and Maintenance facility. 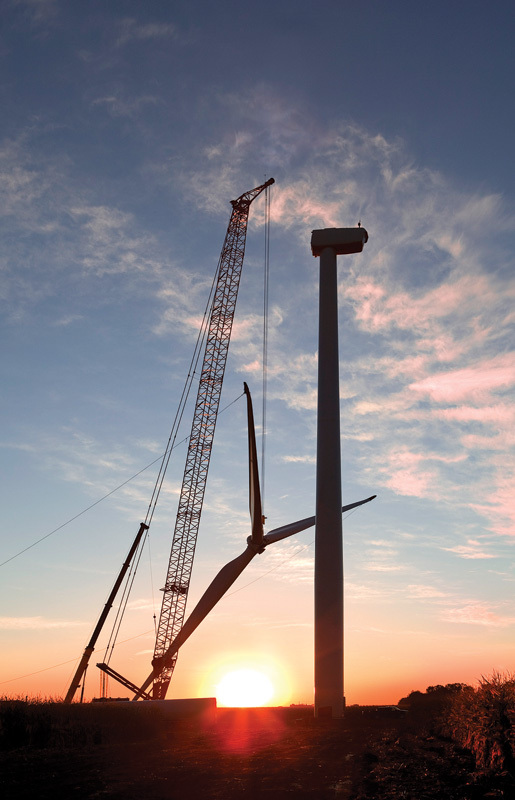 The Nobles wind project is the 17th wind power facility that Mortenson has built with long-term partner enXco and is the second project that enXco and Mortenson have constructed for Xcel Energy. 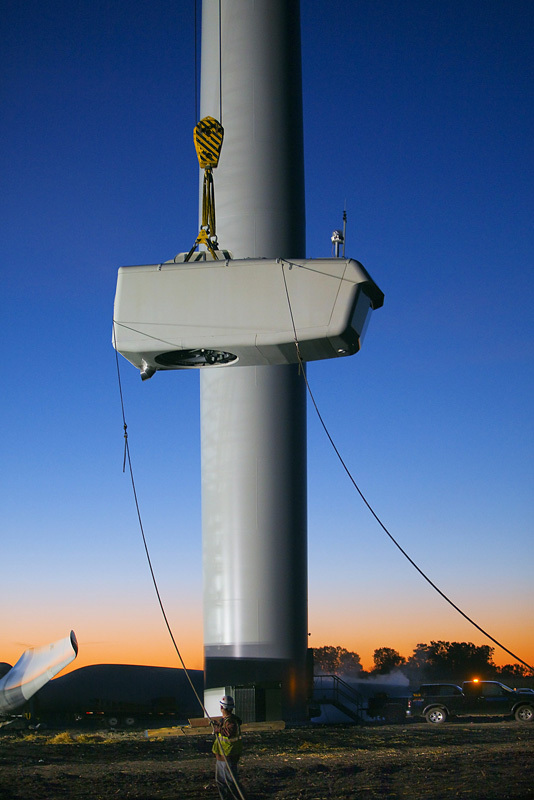 The Nobles Wind Power facility became operational this past December. Rick Halet, the project manager for Xcel Energy, explained that the Nobles wind farm project followed pretty much a straight chronological timeline. "Contracts for the project were signed in late-2008, the site development work happened in 2009, and wind farm construction took place in 2010," he says. Xcel Energy has done a few projects with both M.A. Mortenson Construction and enXco. They worked with enXco on the Grand Meadow Farm wind project, in Dexter, Minnesota. Xcel Energy is in the process of developing a third wind farm with enXco that it will also own, a 150-megawatt project called Merricourt in southeastern North Dakota. This type of business model—with enXco developing the project then turning it over to Xcel Energy—works well for the utility. "There are a lot of factors that go into a contracting strategy," says Rick Halet, project manager for Xcel on the Nobles wind project. "One advantage a developer can have is that they have already done work to acquire land or land rights. If they already have a start on that, or completed it, that’s definitely a benefit they can deliver. "What it comes down to is you look at what is out there and what is available in terms of projects, and what you have to do versus the work that others have already done. And you decide which way you want to grow as a company." It can also come down to company resources; is a utility better off overseeing a project that is already in development, or should it start a project from scratch? "We went through a Request for Proposals process, and the Nobles project was one of the projects offered in the bid process." The wind-rich site appealed to both the developer, enXco, and of course, Xcel Energy. "This particular project happened to be at a site where it would interconnect directly to the Northern States Power Co. (NSP)-owned transmission system," he said. NSP is an operating company of Xcel Energy. "That was a bit of a plus, but it was not an overriding factor in its selection. The wind capacity for the site was in the high 30 percent range, almost 40 percent, also making it an attractive site." The Nobles project and several other wind projects are located in the wind "sweet spot" of Minnesota—Buffalo Ridge. "It is one of the highest wind resource areas in the state, if not the highest," says Halet. The Nobles project site starts west of the town of Worthington, Minnesota, and goes north of I-90. Although it involved construction of a fair bit of access road, the project had the benefit of the section road system that exists in rural Minnesota, and many Upper Midwest states. Basically, there are east/west and north/south roads every mile. "Some of the roads are well established, some are paved, and, well, some are just gravel," says Halet. There were also some minimum maintenance roads—a very apt description, he notes. That said, working with any type of road is better than having no road to work with. The project developer, enXco, had a fair number of landowners to deal with—81 landowners, to be exact. The company met with landowners individually and also scheduled public meetings, to keep the community informed about the project. Xcel Energy representatives also participated in the public meetings. Xcel Energy has done a number of wind power projects, and Halet notes that support for wind power projects in a community can vary. "They can receive a lot of support in principally agricultural areas. The landowners look at turbines as another kind of cash crop on their land, a revenue source. "In areas where you have landowners with hobby farms, or where people move to the country and commute to jobs in the city, it can be a different reaction—you run into less support in those situations." The area where the Nobles project was built is strongly agricultural, so it received the support of local farmers. In addition to the revenue wind projects bring to land owners, some local governments are also paying more attention to the tax revenues that wind projects bring to an area. The revenue is very welcome to a county’s coffers. The Nobles’ turbines are located within Olney, Dewald, Larkin, and Summit Lake townships. As is usual with Xcel wind power projects, a number of environmental studies were carried out for the Nobles project. "There is a standard set of studies that forms part of the development process," explained Halet. "This includes wetlands delineations and threatened and endangered animal and plant species—it’s an extensive environmental analysis. "It also includes any aviation issues, to make sure that where we site the turbines is not going to interfere with any kind of aviation traffic, and also developing a lighting plan to determine which turbines need aviation lights." There are also studies to locate microwave communications beams that may go across the site, so there is no disruption in communication signals. "It’s a robust set of studies that also includes cultural types of resources, with an archeological study done where roads are being built and turbine sites to make sure there aren’t any culturally sensitive areas." Buffalo Ridge, where the project is located, is a broader ridge with gradual inclines and declines, rather than a narrow, high ridge, as might be seen in other areas of the U.S. The region is characterized by rolling hills and, of course, high average wind speeds. This part of Minnesota is actually part of the Mississippi River/Missouri River divide, with water flows to the east eventually flowing into the Mississippi and water flows to the west eventually flowing into the Missouri. The Buffalo Ridge region has some recent history with wind power. The first wind turbines were reportedly built in the area in 1994 by the Kenetech Corporation. In 2006, PPM Energy (now part of Iberdrola Renewables) and Xcel Energy built the 150 MW MinnDakota wind power project that straddles the state boundary between Brookings County, South Dakota, and Lincoln County, Minnesota. Minnesota moved up in U.S. wind power rankings in 2010, with the state increasing its wind energy production capacity by 22 percent. In 2010, Minnesota passed the state of Washington and now ranks fourth in the nation in wind power production. Minnesota wind companies added 396 megawatts of capacity last year—including the 201 megawatts of the Nobles wind farm—bringing the state’s total to 2192 megawatts. Wind power in Minnesota also grew faster than the nation as a whole last year—U.S. wind energy production increased by 15 percent in 2010. For the latest wind power rankings in the U.S., please refer to the Wind Energy Fast Facts on page 28 in this issue of enerG. Construction-wise, Halet says the Nobles project was fairly typical, in that there were some weather challenges, but nothing unmanageable. "The summer was a bit wetter than normal, and that caused a bit of difficulty," said Halet, who spent the summer on the site, along with eight other Xcel Energy people, overseeing the project. "The rain meant waiting for some of the roads to dry out so we could move some of the more heavy loads." There were the usual regional weather issues to deal with such as thunderstorms. This kind of weather has a big impact on a wind power project—unlike other energy-related construction projects, say a natural gas or coal power plant—because the work on wind power projects is all outside, notes Halet. "If there is a thunderstorm or lighting in the area, you call everybody in. "Safety is the number one thing—no job is so important that you want to put people in harm’s way, no matter whether you are on schedule or behind schedule." Depending on the phase of the project, weather is also more of a factor. "When lifting and stacking large turbine components, you generally can’t do that in winds over 22 mph. If the wind is high on a particular day, you have to shut that activity down. Once the turbines are up, there is internal wiring to do, but you don’t want people in towers doing that work when you’ve got lightning in the area." The southern boundary of the project site is up against I-90, just west of the town of Worthington, which was helpful in terms of bringing in equipment and components. The daily work flow was fairly predictable, with each morning starting out with Plan of the Day meetings, so everyone on site was in the know on what was happening that day on site. Big picture, wind projects are all about work flow, says Halet. "You start with the civil folks putting in roads, followed by the foundation and all the concrete work, and then you have the turbine parts delivered and erected." But he noted, as with all wind power projects, the work is not quite as separate as it sounds. "With this whole process, there are some points towards the middle of the project where you actually have the major activities all going on at once. You still have people building some road, you have people building foundations, you have people erecting turbine components, and you have electrical contractors trenching cable." That represents a fair number of activities—and people—for the contractor, Mortenson, to orchestrate. The work force on site peaked at about 300 people. In some ways, a wind power project is like a train that has to keep moving forward—it can’t be waiting at the station, or at least not for very long. "You don’t want any people waiting because of something not being ready," Halet explained. "You don’t want the foundation people waiting because the roads aren’t ready, and you don’t want the cranes, which are expensive, waiting for turbine component deliveries or waiting for the concrete in the foundations to come to their full strength so they can start erecting equipment." In many respects, the construction and management skills required for building a wind farm are similar to the skills required for any major energy project, notes Halet. "To the extent there are differences, it’s probably more in the development phase," he says. "With a project like Nobles, the developer is dealing with 81 landowners and the issues of having a 42 square mile site versus something that is more compact, a coal or natural gas powered facility, for example."